Shelley, our regular contributor from Down Under is here to bring to our attention a gorgeous Weekend Getaway Dress in a digital printed fabric that she spotted recently. Now I’ll hand it over to Shelley. Have you heard of Frocktails? It’s an annual cocktail party for people who sew. I was one of the co-organisers of Melbourne Frocktails, and I was delighted to spot a Liesl + Co. Weekend Getaway Dress in the crowd. What better way to start a conversation than with: “I love your dress, and I know Liesl would too.” Happily, Carita agreed to share her perfect party dress with us. To start with, I made a mock-up blouse to test for size. It came out bigger than I needed, but has nonetheless been very wearable and I’ve already worn it three times to work in the last fortnight, tucked into a skirt. The sizing was really my only issue. 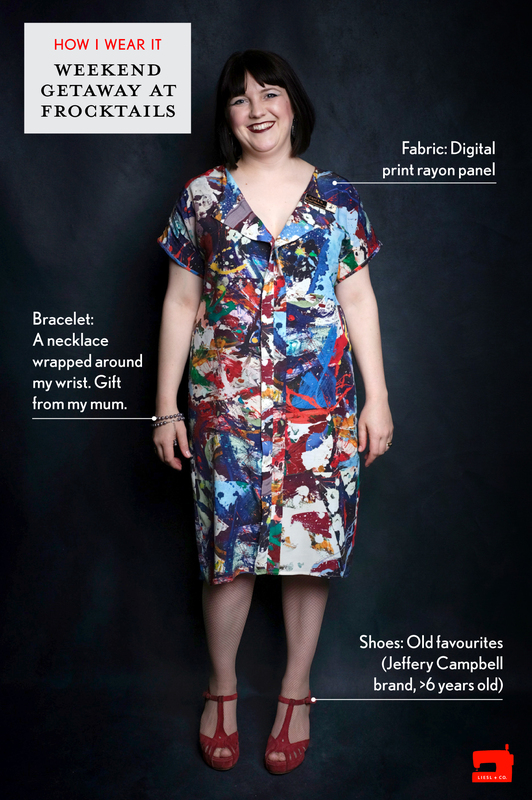 When I made up the blouse in the size that accommodated my measurements on the chart, (size 12) I really felt the top was too loose and a dress would have swum on me, so I made the dress a couple of sizes smaller (size 8) and was much happier with the fit. I found the sewing instructions incredibly detailed and clear. The markings and explanations on the pattern are easy to follow. The PDF pieces came together easily. I was really impressed by the clever way the instructions are drafted so that you can enclose the collar inside the shoulder and neckline seams very neatly. I don’t own an overlocker so I really appreciated the detailed and helpful instructions on finishing all the seams in a way that provides a neat finish everywhere. I followed the pattern instructions very carefully for the facing, collar and shoulder seams and used an overlocker stitch on my regular machine to complete the last few steps on the shoulder seam. I French seamed the side seams. I used bias tape from the dress fabric to finish the sleeve hems. I hung the dress overnight to let it settle before finishing the hem, which I sewed simply by turning up and machine stitching, as per the instructions. The dress was incredibly comfortable to wear. I felt fabulous all night and I will certainly wear it again. I hope to bust it out a few times over the Christmas party season coming up. Thanks Carita! I hope you and your dress get to enjoy lots of summer festive season parties. really fun dress! I love it and it looks great on you! I love your fabric choice. I have this pattern in my queue to make a blouse, but I will re-think making a dress now. Thanks for sharing! How fun! And it looks wonderful on you.